My current writing class at Boston University revolves around sitcom characters. For our final paper we were given free reign to choose our own topic on which to write about. Because I’m insane and the biggest fan of The Simpsons you will ever meet, I wrote about Homer Simpson. Specifically how he is both an “everyman” and the most successful man in human history. Seeing as I had far too much fun with this assignment I figured I would share my paper. Without further ado, my Homer Simpson paper. Few people in this world can identify as a former NASA astronaut, a Grammy winner, or a contender for the heavyweight boxing championship of the world. Only one man can identify as all three. Nestled into his throne, the right-hand edge of the living room couch at 723 Evergreen Terrace, Homer Simpson is one of the most accomplished men in human history. Over more than two decades, viewers are shown the ever-increasing talents of the patriarch of the Simpson family. Homer finds his way into new, exciting job opportunities with stunning regularity. Not all of them are glamorous, but more than a few would presumably lead to national fame. Yet, Homer remains a somehow unrecognizable face to many, including his long-time boss C.M. Burns. Because of this, Homer is also shown as an everyman, working to provide for his family and raise his children. Questionable parenting choices aside – choking Bart frequently – Homer is a relatable, realistic American male. Throughout the twenty-five seasons of The Simpsons, Homer Simpson is shown not only as the most successful unfamous man in America, but also an everyday American as well. For two and a half decades, fame has eluded Homer Simpson despite multiple moments in the spotlight. 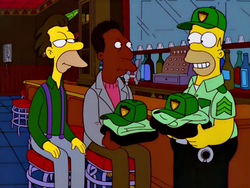 One of the brightest examples of said spotlight was during season eight’s “The Homer They Fall.” Homer gets caught in a bar fight at Moe’s Tavern against the fathers of three local bullies. Despite being beaten senseless, Homer remains on his feet. 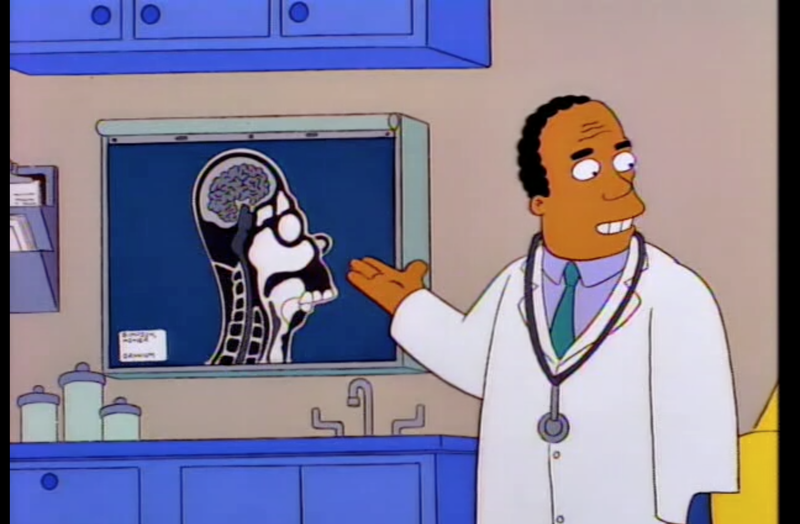 Dr. Julius Hibbert diagnoses Homer with a medical condition unique to him that provides “an extra layer of cushioning around [the] brain one-eighth of an inch thicker than most.” With this knowledge, Homer begins a boxing career at the advice of bartender Moe Syzslak. 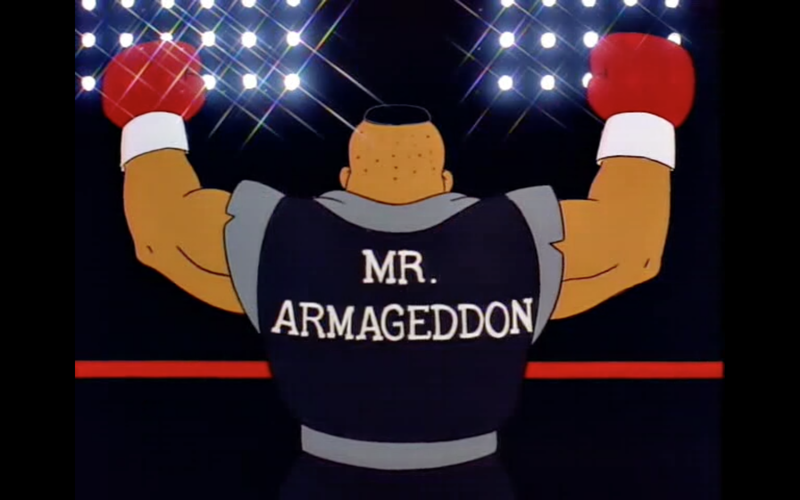 Homer wins enough fights in a row, thanks to his physical incapability of being knocked over, to attract the attention of Lucius Sweet, the promoter for heavyweight champion Drederick Tatum. Homer, nicknamed the “Brick Hithouse” and “The Southern Dandy,” fights and eventually forfeits the fight to “Mr. Armageddon” Tatum when it appears he will die standing on his feet at the fist of the champion. 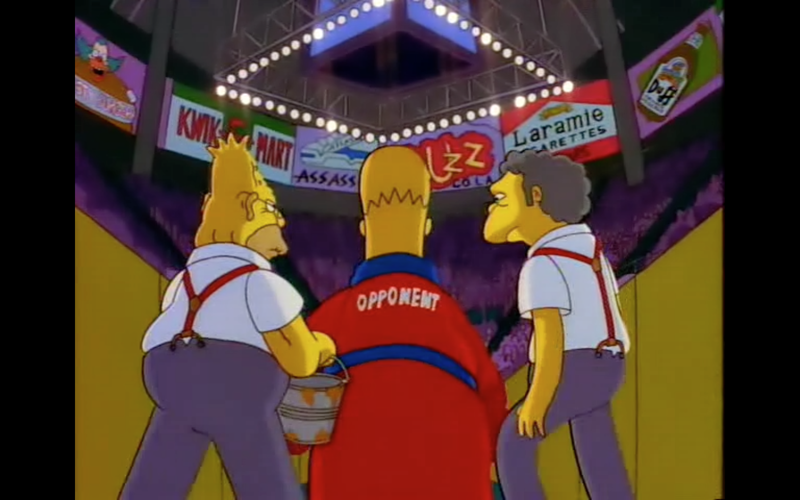 Homer is featured in a pay-per-view main event boxing match against the man who is recognized as the best fighter on the planet in his return to the ring. There are thousands watching this fight in the arena and, presumably, more watching at home. What’s unavoidable about this public spectacle is how it is a defendable matchup. Seemingly Homer is unbeatable as evidenced by his perfect record in the ring. It would be one thing if the fight was a publicity stunt, but instead it’s a true draw. The top in the game is fighting against a quick rising contender. This narrative would have even casual boxing fans interested in Homer, thus making him a large public figure. Homer is front and center before the public eye yet does not maintain any fame after the fight. At no other point in the series does any character mention Homer’s brief, yet oddly successful, boxing career. This is even weirder when considering that Homer gained enough of a reputation to fight Tatum in the first place yet no one seems to care one the fight ends. Despite narrowly skirting death by Tatum, Homer remains a normal, everyday, American father. Homer’s boxing career did not gift him with great fame. This could not possibly be the case with Homer’s trip to space. An average citizen being shot into space live on national television would have to pique the interest of the general public. 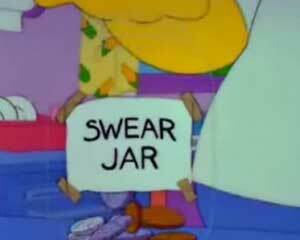 As with every Homer story, however, the logical outcome is wrong. In “Deep Space Homer” the patriarch of the Simpson clan becomes the newest NASA astronaut. When the space program decides to recruit a normal, everyday American for their latest trip to the great beyond, they find Homer after he calls into their headquarters to complain about the low entertainment value of televised space launches. NASA wants to draw attention back to their space missions, so the idea of sending a “normal” person all the way off the planet becomes their method of grabbing renewed media coverage. After competing with his best friend, Barney Gumble, for the chance to fly to the stars, Homer wins by “the two sweetest words in the English language: de-fault.” Homer is shot into space alongside a fictional astronaut and guest star Buzz Aldrin, the second man on the moon. Homer sparks disaster by smuggling aboard a bag of potato chips, which explode around the aircraft’s cabin, shorting out the electricity on board. 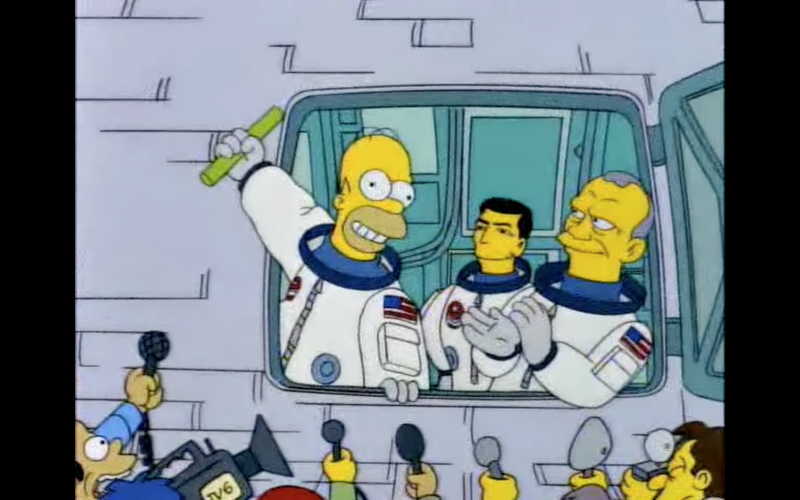 Further, Homer breaks the handle to a door on the shuttle, creating a fatal danger for the crew, before accidentally fixing the problem with an “inanimate carbon rod.” Despite Buzz Aldrin specifically mentioning to major news reporters that Homer saved the day, the rod gets the credit, magazine covers, and parade given to a true hero. Even without the credit for saving the day, Homer should, by all logic, become a household name thanks to his status as an everyday citizen and the national press that had been following his journey. Yet again, the fame that should come with Homer’s shenanigans is nowhere to be found. By the next episode of the series, “Homer Loves Flanders,” not a word is brought about regarding the fact Homer almost lost his life in a space shuttle disaster. The world of The Simpsons is quite peculiar this way. The Be Sharps goes on to win a Grammy award for “Baby On Board,” cementing their spot in music history. Or so it seemed. With the follow up to the group’s debut album titled Bigger Than Jesus, the band disappears from the public consciousness almost as quickly as they had appeared. To conclude the quartet’s run the members assemble on roof of the same bar, Moe’s Tavern, where they first became famous, to play a final show. When the citizens of Springfield hear the familiar tune of “Baby On Board” bellowing through the streets, all attention is diverted to the music. 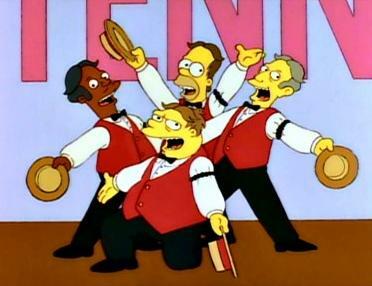 Essentially, Homer and his band mates shut down the neighborhood (“Barbershop”). This makes sense considering Homer’s status as an internationally successful, award-winning musician as dictated by the story. Yet as with “The Homer They Fall” and “Deep Space Homer,” the fame gained within the twenty or so minutes of run time do not matter to the world of The Simpsons beyond this episode. 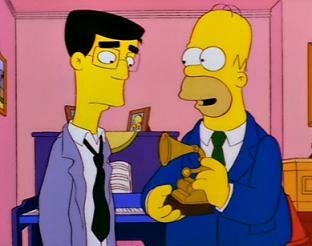 In fact, the only other mentions of Homer’s trip to space and his Grammy award are to Frank Grimes in the episode “Homer’s Enemy” when Homer gives his co-worker a tour of his home which includes trinkets collected from his various adventures. The three episodes discussed at length are some of the richest examples of Homer’s inability to maintain a spot in the public eye. As evidenced by the quote above, there are plenty of other instances of Homer’s brushes with fame through the series. This list is especially impressive when it’s timing is taken into account. “Poppa’s Got A Brand New Badge” was the finale for season thirteen, meaning another twelve seasons have passed allowing for further Homer hijinks. This all ties back into a fundamental issue with the show. What is the reasoning behind having Homer constantly reset to an unfamous person despite how illogical this is after his numerous accomplishments? The answer is simple; Homer must remain an everyman for the sake of the show. What has made The Simpsons into the television classic it is today is the ability for viewers young and old, domestic and foreign, and all other applicable adjectives, to personally connect with the characters despite their status as cartoon characters. With Homer serving as the de facto main character – he is the central character in the majority of the episodes of the show – he must also be the most relatable for the show to be successful. Therefore, Homer must be an everyman. The qualifications of an everyman are simultaneously easy and hard to meet. 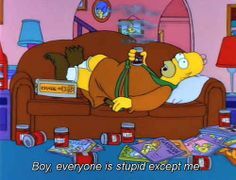 Webster’s Dictionary defines an everyman as “a typical or ordinary person.” In order for Homer to be a relatable character for the audience, he must be an everyman. Chris Turner, author of Planet Simpson: How A Cartoon Masterpiece Defined A Generation, labels Homer as an everyman because he exemplifies multiple American stereotypes. 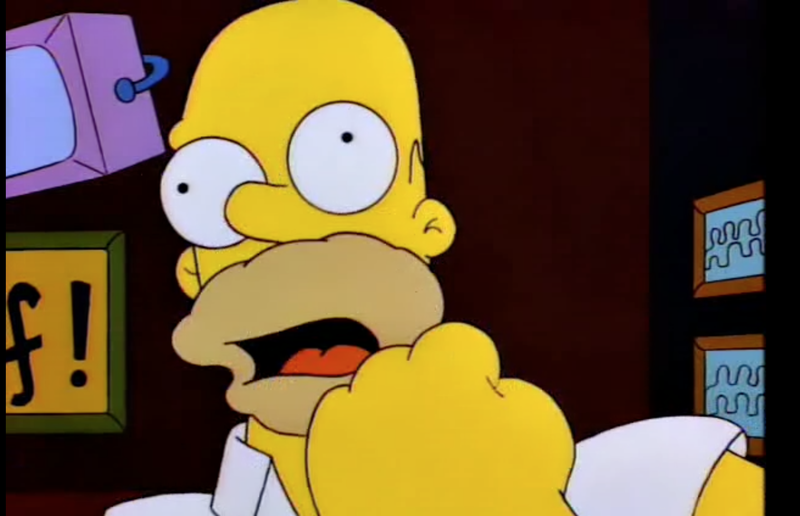 These include Homer’s being “crude, overweight, incompetent, clumsy, and a borderline alcoholic.” These five qualities are routinely on display throughout the show, but each is given opportunities to stand alone as the focus as a story on occasion. The subplot to “Bart The Lover” features Homer being challenged not to swear by Marge after he exclaims vulgarities within earshot of neighboring kids Rod and Todd Flanders. A montage of multiple annoyances, all punctuated by a censored swear and Homer’s hand dropping money in the family swear jar, follows. This is Homer at peak crudeness. 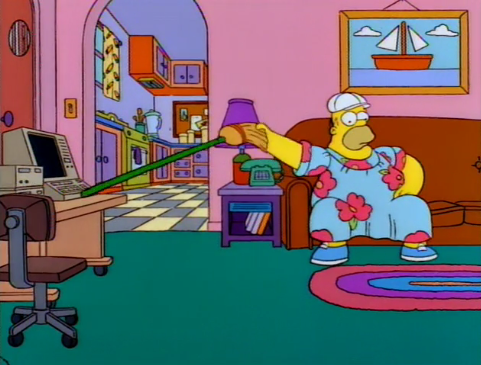 In “King-Sized Homer” Homer learns of a loophole through worker’s compensation that will allow him to work from home. All he must do is gain thirty-one pounds to eclipse the three hundred pound mark and qualify for coverage. With the assistance of Bart Homer gains the weight and reaches his greatest weight during the show’s run. The story of “Homer Defined” deals with Homer, a nuclear safety technician, saving the Springfield Nuclear Power Plant from a meltdown and Springfield from a Chernobyl-esque doom by using a nursery rhyme tied to a guessing game. 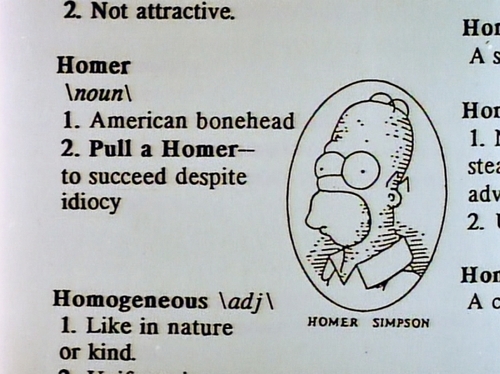 This somehow works and Homer reaches a sky-high level of incompetence. During “Homer the Heretic” a church-boycotting Homer stays home to enjoy his newly free Sunday morning thanks to no religious services. While relaxing on the couch of his living room, reading Playdude Magazine and smoking a cigar, Homer, unsurprisingly, falls asleep. Similarly unsurprising was Homer’s forgetting to put out his cigar before falling asleep. The cigar falls onto the rug, igniting the Simpsons homestead into a two-story inferno. Homer is eventually saved by his neighbor, Ned Flanders, as is the house by Springfield volunteer firefighters. Allowing his house to almost burn down due to outright negligence is Homer at his most clumsy. 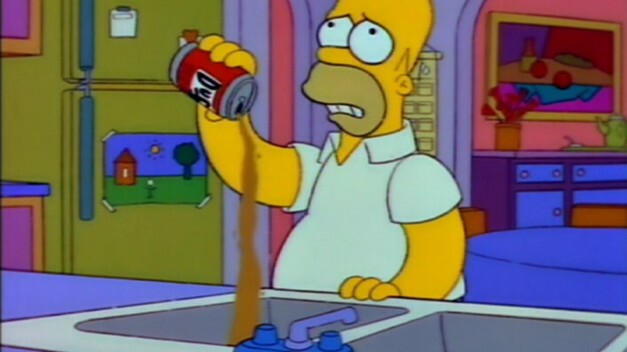 “Duffless” is one of the few examples of The Simpsons that deals with Homer’s apparent alcoholism as a serious problem. After being arrested for driving under the influence shortly after leaving a tour of the Duff Brewery, Homer is asked by Marge to quit drinking for an entire month. The episode deals with Homer’s numerous struggles with alcohol and his attempts to calm down his actions. By diving deeper into Homer’s relationship with Duff beer, the audience understands the true depth of Homer’s alcoholism. All of these episodes come together to prove Turner’s point. The qualities he had singled out are, again, visible in just about every moment Homer has during the series, but they are also critical enough to Homer as a character that they command full episodes to better establish Homer as a relatable American. By hitting upon these stereotypes and therefore becoming a relatable character for the audience, Homer is an everyman. There is still the matter of Homer’s fame. One would assume there must be a reason as to why Homer cannot maintain his fame after so many successful moments. This assumption is true. Homer cannot appeal as an everyman if he is famous. The number of regular citizens easily trumps the number of true celebrities in the United States. By keeping Homer as the former the appeal to the masses grows along with the fandom for the series. People who are not famous will relate to a similarly unfamous person. If Homer were to suddenly become a nationwide figure, the dynamic of the show would entirely shift. Homer would discontinue to be an everyman because he would no longer represent every man. He would instead be representing Homer Simpson and Homer Simpson alone. 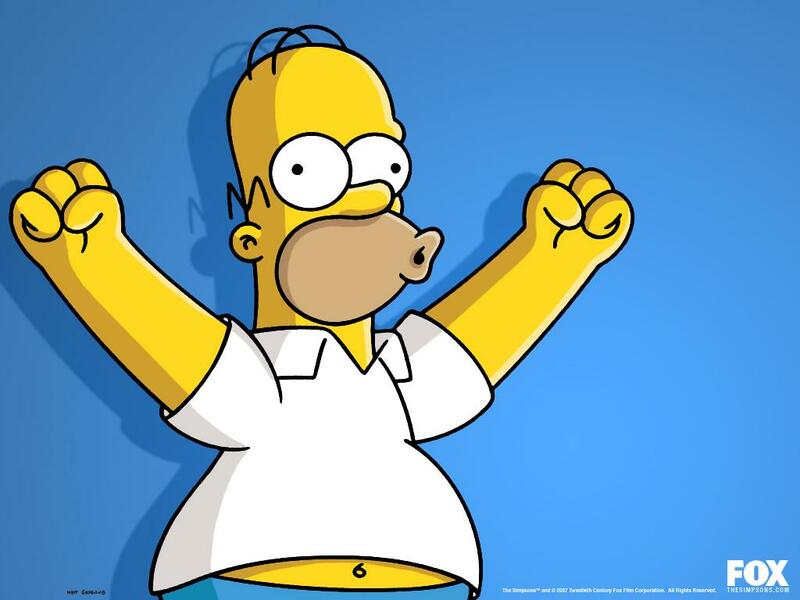 To remain The Simpsons Homer must remain America’s symbolic father figure. This also explains why he never deviates from the character qualities outlined by Turner. Homer has to be everyone to be Homer. This is how The Simpsons works. Therefore every time Homer has an adventure that leads him into large waves of popularity he must inevitably end up back at his beginning point so the show can, quite literally, go on. Homer Simpson is an everyday American man because he exemplifies multiple stereotypes of American culture that make him relatable. Due to this designation, he is locked into a character that never develops through the series run of The Simpsons. However, because watching everyday life would be boring, Homer is entered into multiple situations that bring him, albeit temporary, fame. Despite having legitimate success ranging from a Grammy win to employment with NASA and a fight for the heavyweight boxing title of the world, Homer never remains famous. This is because the fame would change who he is and the show as a whole, thus destroying the program. Therefore Homer Simpson must simultaneously be an everyday, average American while also doubling as the most successful unfamous man in history.